Attention gardeners! A substantial part of Maryland will be experiencing temperatures at or below freezing in the early hours of Tuesday. See this Washington Post article for details, and if you have tender plants putting out growth (or if you succumbed to the spring craziness enough to put in your warm-weather transplants far too early) take steps to cover them this evening. Floating row cover, burlap, an old bedsheet, anything will help. 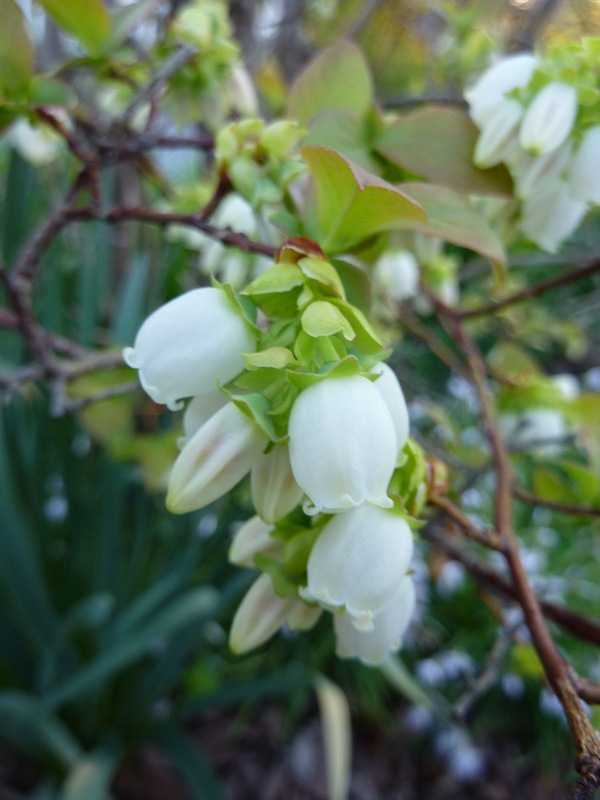 My worry is for my blueberries, in photo taken this morning, already in bloom – in March! Somehow it didn’t help to yell at them that they weren’t paying attention to the calendar. I'm worried about my plants with tonight's freeze. I have green beans, carrots, onions, broccoli and spinach already growing well in my outdoor garden plot. What do you recommend to protect them? Cover the bean plants with a quilt or some other fabric tonight. Cold snaps could cause problems for your broccoli- no head or small head, premature seed stalks. The other crops should be ok. I have a relatively large lilac bush/tree that is starting to bloom. I don't think I have a cover large enough. Is it doomed for the season? Peas should be okay. Lilac probably also – we'll just have to hope for the best.